is a high-quality green tea extract with 98% polyphenols. EGCG and catechin content are measured by HPLC. Our product is additionally enriched with black pepper extract with 95% piperine content. . Product is suitable for vegans and vegetarians! 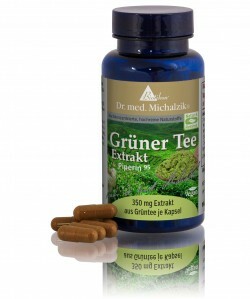 Green Tea Extract by Dr. Michalzik is subject to strict examinations of German supervisory authorities. It is manufactured by use of gentle production technologies without heat or additives and without the use of processing agents which are not required to be mentioned on the packaging. Adults: 1 capsule with fluids, twice a day. 60 capsules, 350 mg of green tea extract and 5 mg piperine extract per capsule.